They were willing to wait for it and they didn't throw away their shot! 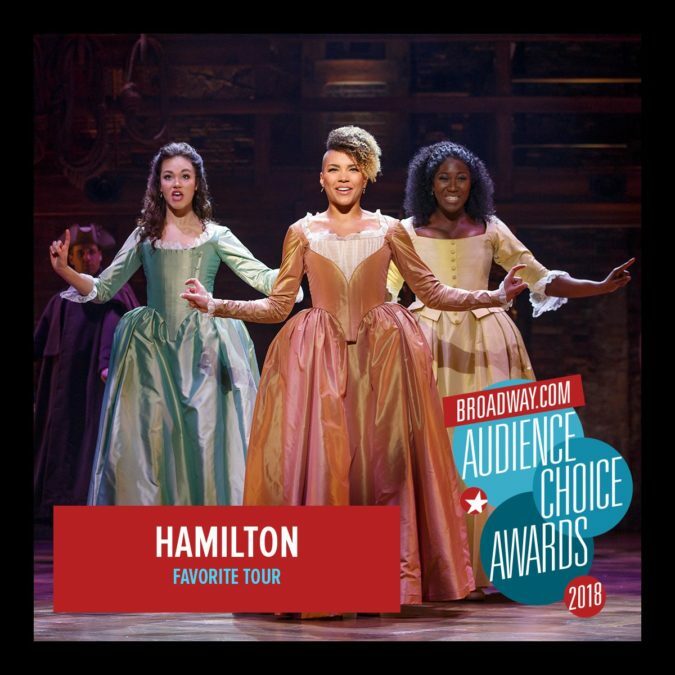 The North American touring production of Lin-Manuel Miranda's musical masterwork Hamilton won the 2018 Broadway.com Audience Choice Award for Favorite Tour. The 19th annual Broadway.com Audience Choice Awards will be presented at a private cocktail reception on May 24 in New York City. The Hamilton tour, currently playing Houston's Hobby Center and Costa Mesa's Segerstrom Hall, continues to criss-cross the country, with upcoming engagements in Atlanta, Minneapolis, Boston and more. This marks the first time the traveling production of Wicked hasn't won the Favorite Tour BACA trophy since the category was introduced in 2011. The Broadway production of Hamilton, currently running at the Richard Rodgers Theatre, won 11 2016 BACAs, including Favorite New Musical and Favorite New Song for "Satisfied." With book, music and lyrics by Lin-Manuel Miranda, direction by Thomas Kail, choreography by Andy Blankenbuehler and musical supervision and orchestrations by Alex Lacamoire, Hamilton is based on Ron Chernow's biography of Founding Father Alexander Hamilton. In 2016, Hamilton received a record-setting 16 Tony nominations, winning 11, including Best Musical, and was also the recipient of the 2016 Grammy Award for Best Musical Theater Album and the 2016 Pulitzer Prize for Drama. The Chicago production of Hamilton began performances at the CIBC Theatre in September 2016. The West End production of Hamilton opened at the Victoria Palace Theatre in London in December 2017, winning seven Olivier Awards, including Best New Musical. The first U.S. national tour of the show began performances in March 2017, and a second U.S. tour opened in February 2018.